During a recent interview with Gaming Reinvented (https://gamingreinvented.com/), I opened up on the “success” of our “first” title: Rogue Sharks Arcade, which has been played by over 3 millions players around the world. I thought this may be an interesting story for other developers, so I’m sharing it here. Rogue Sharks Arcade seemed to be your first game, and it was pretty damn successful. Did you imagine it’d have 3 million+ players? Haha, this one’s a good story I think. Rogue Sharks Arcade was some kind of “accident”, both the game itself and its “success”. I started working on Soul Reaper back in September 2013 and came to the realization that the game was way too ambitious for a first game. I would need money to hire artists and more, but didn’t have the money. So I thought making a simple mobile game, similar to the classic gravity-based helicopter web game, would be my way out. For some reason, Sharks was the first theme that came to mind. I thought Rogue Sharks would take one month to build. I had limited Unity experience back then, but that’s not why it took much longer. It took about a year to build. The game just wasn’t fun enough by my standards, so I re-did it a few times with different mechanics. I released Rogue Sharks Arcade two months in, since the game had enough content to be a full-game loop. I released it on the web on Kongregate and was hoping to get feedback so I could improve it for mobile after. Money was not the target here. About 200 people played it on Kongregate and had a score of 3/5, confirming my assumptions: it’s not a very good game. But here’s the interesting part: how did I get from 200 players to 3M+? The short answer: it was stolen and put on MANY other websites around the world. You see, I was too dumb to protect it, and I didn’t even put my company logo or the game title in the game, so people just rebranded it and claimed it as their own. It got featured on lots of Chinese, Turkish and Russian websites. There was no English text in the whole game. Everything was icon-based, so it was accessible in any language. BUT, because of that incident, I got exactly what I wanted: feedback. With 200 players, I got close to no feedback, with 3M+, there were plenty of players to give feedback. I had to track websites down and translate feedback back to English, but still, there was lots of feedback. But that’s not all, I was tracking everything in the game using Game Analytics. I knew exactly how people were playing, so I knew how to improve the game for mobile. But then at that point I was travelling around the world with my wife for about a year, so I didn’t have much time to make the mobile version. But I did it anyway. I stopped Chiang Mai, Thailand, to work on it for one full month and finished it. 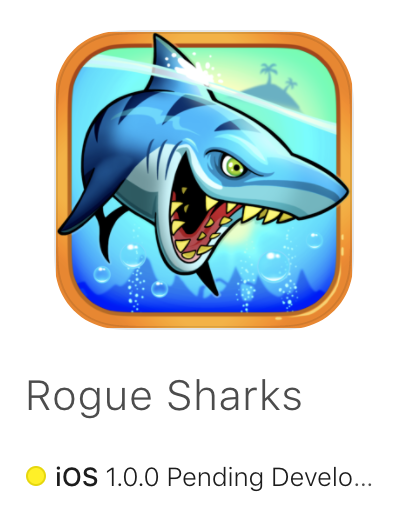 So Rogue Sharks for mobile exists, and is a much better game than Rogue Sharks Arcade on the web. I never released it though, because it’s still bad in my opinion. We were in 2016 then and there’s millions of games in the App Stores. A lot of them are great and have a much bigger budget than we had at the time. Unless I found a good partner to release the game, I figured there was no point releasing a game no one would discover and play. Plus, we’re Power Level Studios, we want to make great RPGs, not game genres we know nothing about. So yeah, the game was “successful” for what we tried to achieve, but definitely no commercial success. And yeah 3M+ was definitely not expected! Getting your game stolen is not necessarily all bad. We got the feedback we needed to make a better version of the game for mobile, which would not have been possible otherwise. Is it a valid marketing strategy? Well maybe. If you’re a little smarter than I was and add ways to track actual players’ contact info, it may be one of the best ways to get discovered.